The result is able to handle threaded application code (translating the threads into a series of yields with setTimeout (mentioned in the presentation and demonstrated in the Tetris example). The application can use regular Java conventions for designing and constructing the UI (as shown here, as well). User Interface components are translated to, similar, HTML ones. It’s not apparent to what extent functionality is implemented, but it is to a certain degree. Keyboard interactions are able to be handled and translated to normal Java callbacks. works on my iPhone. Wicked. The fact that this is an implementation of the VM, rather than just a source-to-source translation, has fantastic implications for the likelihood of getting other languages into the browser via their VM-based implementations. I’m thinking ruby and python, the ones everybody seems to be pining for at the moment. I wonder why it keeps ANDing 0xffffffff. Jesse Ruderman : All numbers in javacsript are represented as IEEE floating point numbers. The `&= 0xFFFFFFFF’ segments are probably being used to mask the numbers into plain integers to avoid rounding errors. Wow. That’s pretty slick. If anyone with the requisite skills is able to translate the presentation PDF to english, I’d love to see it. It’s really impressive to me that the result isn’t “barely” playable, at least if FF3. It’s quite decent. And the load time was darn quick. For kicks, I opened up safari 3, on windows… and then counted 6 seconds from hitting enter on the URL to playing the game. Back on topic… WOW! this has really “got me moist” – i wish there was more in the way of documentation or even a download too but as for translation… for those who have been living under a rock ;) let Google translate the page for you..
From the Google “Japlish” translation it seems that it is up to the developer to recreate most of the “Java” UI componentry in HTML .. basically equating an HTMLElement in the DOM to a Swing Component/Container Bean (Actually, it seems that the abstraction occurs at the JPanel level). All-in-All an excellent piece of work, i’d love to see more! The ANDing 0xffffffff bit looks like a long emulation bit, possibly a unary negation. and no other imports …. so the entire UI seems to be THIER propriatory wrapper around either awt (likely! and easier to implement) or swing …this is also most-likely how they then resolve components easily in the bytecode translation as they only have to worry about “coverting” objects from their namespace…. So, it would seem on closer inspection that it is pretty much identical to GWT or Java2Script No? What IS impressive is the speed; well done on the optimizations..i think some of the UI responsiveness is “smoke and mirrors” in the sense that only bare-wire hookups to existing HTML elements (styled with css) are needed to be emitted and managed, also – like i said before; leaving them open to extension with other UI toolkits.. I bet Step 2 makes the page with the included js and any MODIFICATIONS to the Html needed. The real question is : does it run rhino ? Bitwise boolean operators are the only natives operations implying casting Number to signed 32 bits integer, the two other beeing parseint (which takes a string as main input, thus is much less efficient), and bitwise shift operators which is theoretically slightly less efficient as it involves one more masking operation. This is truly impressive, right ! It is the start of a full CPU development environment. Did anyone found the link to the SDK. I’m eager to test if I can port some RDF utilities to js via it. Interesting stuff. It kind of give me a happy face to see this and might even help us focus with to do with our Java Virtual communications framework. In 1996 when we migrated to the Windows world, the same clients was provided from a device independent standpoint. So you can connect either way and the same consistent framework of Files, Mail, Chat, Who and Personal client applications was provided. Console interacting can be done with telnet, dialup, mobile devices, native gui with our free WCNAVIGATOR and web with any browser. Originally our plan 12 years ago in order to offer interactive sessions under the WEB, we developed our Java virtual com API to offer the same framework with a persistent web connection. However, of the five framework clients, the JAVA API was only used for the CHAT client because we were not sure of the direction. So if you were at at web site and click the CHAT link, it will start a persistent connection with a JAVA window. We used special file associations extension to drive a WEB client or NATIVE GUI client. Will the browsers offer a persistent connection framework? if so how? Will hybrids ideas emerge, like AIR? SilverLight, FLEX? What we really need is for the industry players to get together and develop a new common standard for all platforms that targets remote persistent connectivity technology and multi-threads applications. The alternative may not be what people want in the long term and that is powerful entities giving you this however VIA their centralize servers only. This has a role in the future, but it can’t be the only way the direction will be offered. There is alot here that one post serves no justice. But if there is one concept that continues to be a major concern to me is the idea of dual way communications – unsolicited feedbacks to the user’s machine. This has to be part of the persistent connectivity standard technology because its no longer about just a client/server, but server events into the user’s environment. IPv6 has a major role here. If this isn’t worked out and its becomes a multi-vendor/methods solutions, then we will lost control of the security and privacy aspects here and I don’t know about you guys, but one thing, someone is going to proposed for government involvement to put a stop this high risk problem in the consumer market place. Users’s should still have control of whats coming into their machines. This is amazing. 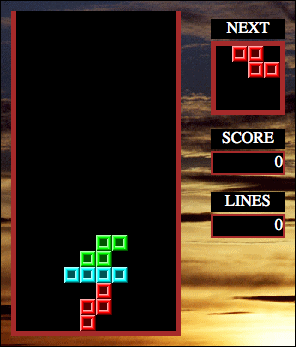 What’s the rotate key on the Tetris demo? press the Up arrow key – the keys i used were the cursor keys ;) …what i want to know is what is the “DROP” key ?? pressing down arrow just moves it down faster not “Drop” it.